This charming yarn bowl comes to life with the cartoon-inspired features of a rotund sheep. 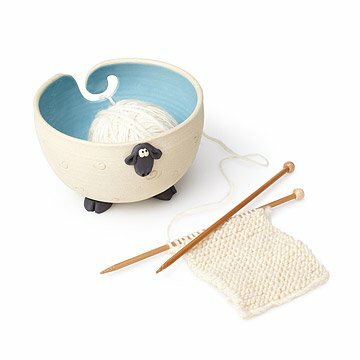 From plush wool yarn to this charming sheep bowl, your crafty creations come full circle in this knitting accessory. Handmade by Becky Ziemer, this charming yarn bowl comes to life with the cartoon-inspired features of a rotund sheep. Each bowl features a lustrous glaze on the inside, lending artful juxtaposition to the speckled, swirled outside. Keep skeins and rolls of yarn in the little sheep's belly, feed the strand through the tail, then enjoy a cozy craft night without any tangles between your knits and purls. Handmade in Memphis, Tennessee. We put Sherman to the test! Will he stand up to a knitting first-timer? Find out on our blog. 3.5" H x 6.5" diam. Will buy Sherman again in future. Well made, well packaged, and adorable product ! This knitting bowl is so adorable, and seems to be great quality. My grandmother loved this yarn bowl. A fabulously cozy addition to her repertoire of knitting gear, and a way for me to show her how much her knitting for me means. I gave this to my mom for Mother's Day, it was such a fun gift to give. It's whimsical and fun to look at, will be a good addition to the end table next to her knitting spot. I love that it's original. This bowl is perfect. I was searching for a sheep yarn bowl for my hubby to get me for Christmas. After purchasing another American made one that wasn't up to snuff (sent back because of the quality), I stumbled upon this surfing the net. It is very well made, is a great size and has the same dopey expression as the pet sheep I used to have. Can't wait till Christmas day when I can actually use it on one of the projects I'm working on now. I started crocheting and my yarn kept getting tangled. This is adorable and super functional and helpful. I love it! Absolutely charming yarn holder. Really works and makes me smile every time I see it. I am really enjoying my yarn bowl. I use it to keep my yarn contained near my chair. The yarn flows freely without tangling or rolling away!. My friend LOVES Sherman. The yarn bowl is perfect for her future knitting prijects for her new grand daughter. As always I am very impressed with the quality and uniqueness of Uncommon Goods items.